We have been shopping here at the Dragon Propulsion Laboratory. A pronounced drop in the prices of Samsung SSD drives featured on Amazon.com quite simply forced our wallet hand (or was that our browser's autocomplete?) into an impulse purchase. Following in the footsteps of "Chaos Manor," the recurring hardware exploration column in Byte Magazine that so many used to look forward to every month, I comprehensively kick the tires of a new storage device. In memory of Jerry Pournelle , Chaos Manor's unequalled author, I will try my best to have some fun while doing so. The drive in question is a solid-state 64-layer V-NAND device manufactured by Samsung. 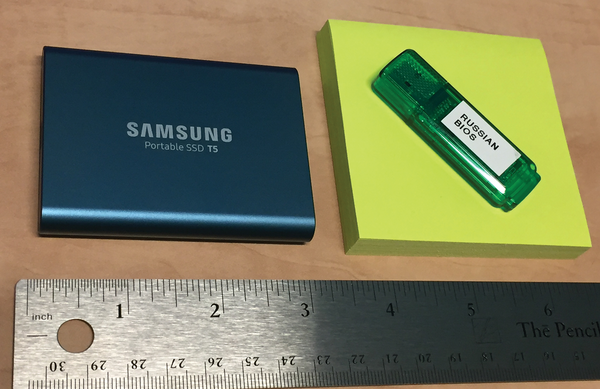 The Samsung T5 is an external drive, quite a bit smaller than older external drive formats defined by the dimensions of their internal 2.5-inch SATA devices, coming in at a mere 2.3x3x0.5 inches (5.8x7.6x1.3 cm) – smaller than a Post-it note (Figure 1). Available in sizes ranging from 256GB to 2TB, the specimen in our lab is the MU-PA500B 500GB unit , priced around $123 at the time of writing. As a second-generation USB 3.1 device, the interconnect maxes out at 10Gbps, making external drive benchmarking a problem of the past where USB C ports are available.